Ademeion, 05 Mar 2013I don't like what Beats Audio does. It changes the sound in an unnatural way, which is quite o... moreyes, totally agree here! in fact i may consider Sony Xperia Z instead of this HTC One because of this lousy beats audio, even though i like the shape and silver aluminum build of HTC One. FoneGuy, 05 Mar 2013Best build EVER. Best screen EVER. Best sound EVER. Best chipset ever (so far) Best camera EVE... moreYou're perfectly entitled to your own opinion, but that doesn't mean others might necessarily agree with you though. Online retailers say they'll be getting HTC One a day earlier on the 14, March. I don't like what Beats Audio does. It changes the sound in an unnatural way, which is quite opposite to what I want. They shoul advertise "sorry, we put Beats Audio in", and lower the price beacause of the fact. [deleted post]China and Taiwan are two different countries. Don't put them together if you don't know the difference between them. You'll confuse readers here. Best build EVER. Best screen EVER. Best sound EVER. Best chipset ever (so far) Best camera EVER. Well rounded tech junkies like myself know that this phone is the bar. No bias, just the truth. AnonD-120036, 04 Mar 2013Plzzzzz How much HTC one?? and if accept ice cream ice cream sandwich program? ?I'm not sure I understand your question... Ice Cream Sandwich is pretty old. You want to run that on a brand new phone like the HTC One? As for cost, my guess would be that it is about $200 with a 2-year contract in the States, though that remains to be confirmed. I see great potential in BlinkFeed. It has everything I need. I always have a clock/weather, agenda and news/rss feed widget trio on my homescreen so this really looks like a logical step in the right direction. I'd love to think it could be implemented with location features and settings with many more apps. Camera wise some say it's great, some say it isn't. The colors are great from what I've seen and the detail good enough. In my opinion it wins just for the sake of the full array of features HTC Zoe has to offer. By far the best camera options and features found on a smartphone. It provides good stereo sound when listening via speakers and superb audio reproduction and output when you have your headphones on. The build of the handset and it's unibody construction are just a testament of how great design is made. It both looks good and is very ergonomic while giving a pleasant feel inhand. It brings innovation and great craft to the consumer. According to all the research, people still prefer slim and light vs. thick and heavy so you have to find a good balance with the battery size. The biggest battery possible is crammed inside the smallest possible body while good software optimisations coupled with low consumption hardware give it a better then average battery life. In the end it's always down to how you use your phone. In this day and age it's good to have a battery bank with you anyways. And as far as the storage capacity goes. I'm fine by 32GB let alone 64GB version. Most people I know don't have big SD cards, usually having 24GB or even less. All in all the phone is impressive from every single angle and I look forward to handling it again and seeing how it fares in the future with it's users and against its competition but for now at least it seems it hasn't any. I've been reading comments here at GSMARENA for years. I am trully amazed how people complain about features of certain phones. I personally think that the phone is capable, beautiful, powerful and there is some inovation like the boom sound. If someone don't like it there is no need to post its negativism. I work at a mobile carrier and I must admit that I am fed up with phones. Every day same specs in different shapes and names :( This phone trully stands out of the crowd. It is not perfect but it is different. We all should be really happy about that. The main reason is that this should whisper to the manifacturers that we, the clients, want something else, not the next Iphone or the same Galaxy even Xperia Z. Common folks embrace the difference this is what we all decerve. OMG!! I actually have TEARS trying to come out of my eyes after reading "Power/Lock button that's also an IR emitter"!!!! OMMMMGGGG!!!!!! I still have an E71 and I looooved using the IR port as a remote for virtually EVERYTHING since TVs to dSLR cameras!! This WILL be my phone, there's no doubt about it now. HTC, Qualcomm, MHL, UltraPixel, BeatsAudio, IR port, all FORTHEWIN!!!! 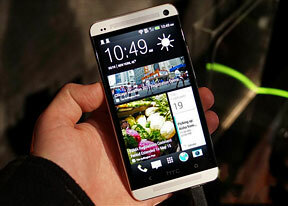 Plzzzzz How much HTC one?? and if accept ice cream ice cream sandwich program?? Good looking and it's nice to see someone caring about the sound quality and amplitude. They made a mistake with the hype on the camera, it's not that great comparing with the rest, it's different but not better than the rest. Put the price bellow 350€ and it's a good deal. I have honestly never met a person in my life who carries a spare battery around with.. seriously.. never.. not at uni, not at work, not at basketball, not in a coffee shop.. never seen anyone with a spare battery - let alone anyone I know.. So many people on GSMArena - and their biggest issue is being able to carry a spare battery around.. hmm.. interesting. 8MP iPhone 5 camera still gets sharper, nicer photos, without purple fringing. Metro, 03 Mar 2013No card slot, poor battery and non-replaceable. Total deal breaker for me. I'll wait for the G... morewhy is it a poor battery?